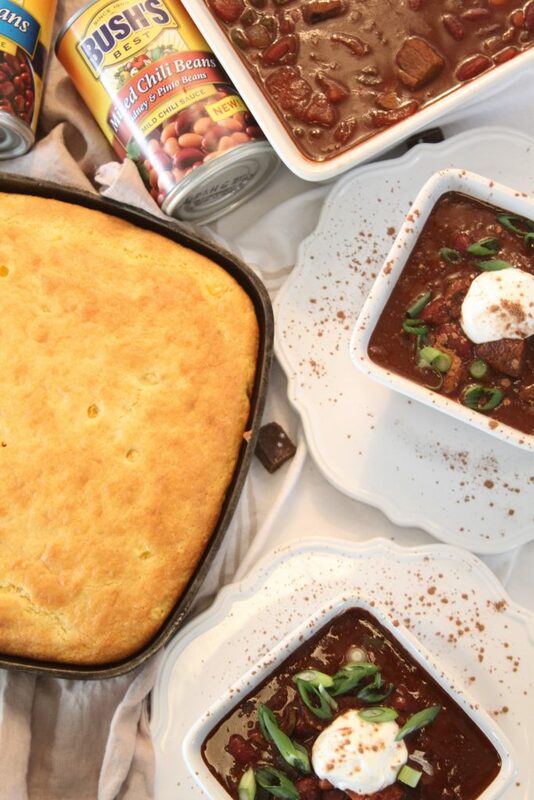 Winter time means chili time around our house. Especially this week when temps have dipped into that arctic blast we’re experiencing across the Midwest. Can I just say BRRRRRRR? 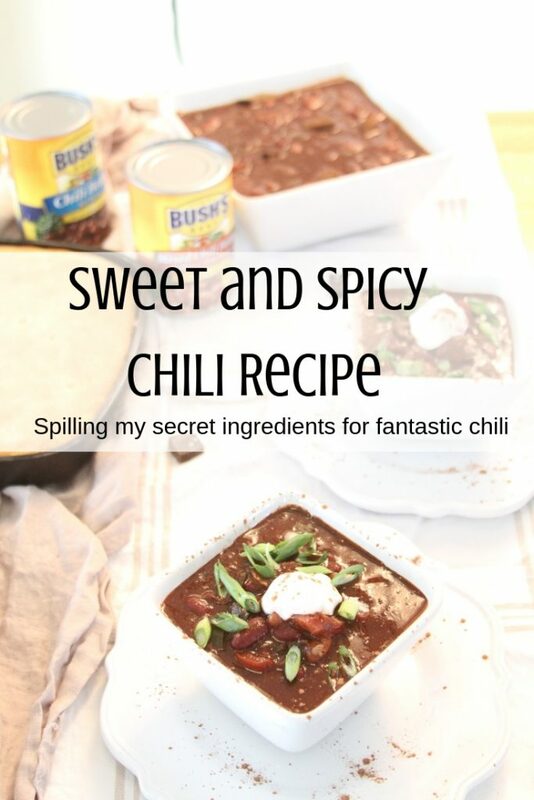 Luckily, my sweet and spicy chili recipe is one way to stay warm. The heat from the pepper and spices combined with the sweetness of dark chocolate makes this a family favorite. Now, before we start on the recipe can we chat ingredients for a minute? As many of you may know I’d been caring for my mom who has many, many health issues (she is back home right now with Dad giving me a break). She was telling me to make sure I buy a really good cut of beef for my chili, but then she wanted me to buy some cheapo brand of beans. Uh, NO, not on my watch. The beans, in my opinion, is just as important as the meat cut. 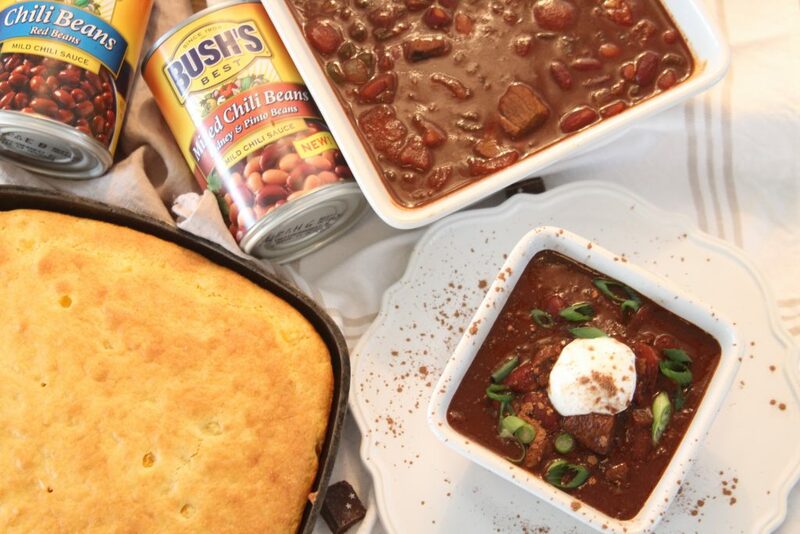 We are a BUSH’S® Beans family. Chili beans, baked beans, black beans, all BUSH’S® and I’m not about to change now. 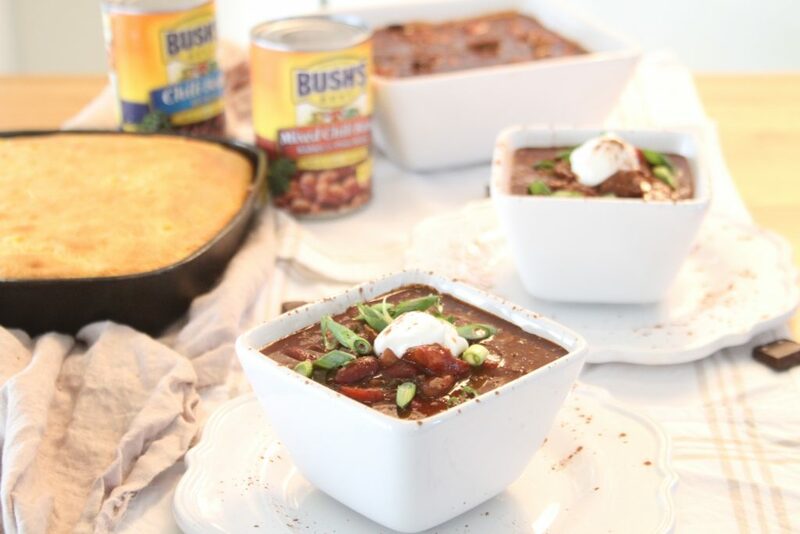 Seriously, there is a reason we only buy the BUSH’S® brand and that is because they have the best beans and when it comes to chili beans they are rock stars. BUSH’S® Chili Beans, made just for chili, are available in pinto, kidney, black, white, red or mixed beans. So many great choices, right, but then it gets better. You can then pick mild, medium or hot sauce. We’re a mild home because I cannot do much spicy heat in my food. 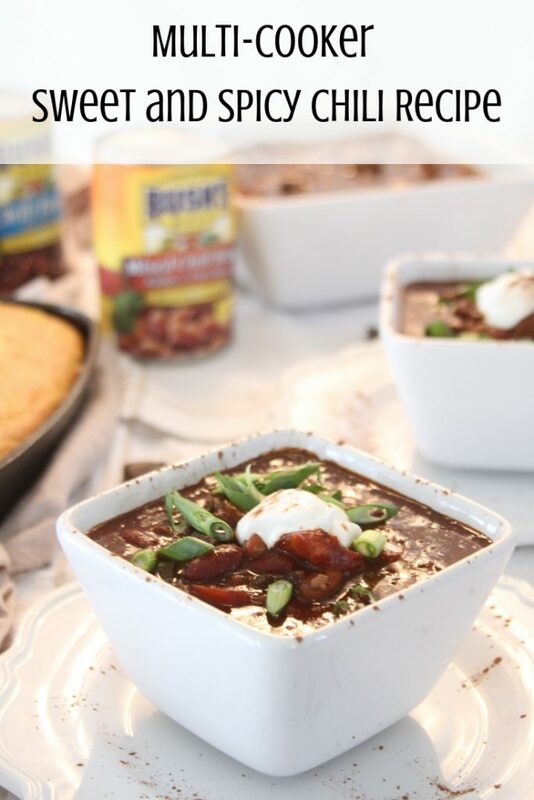 The mild chili flavor I used in this recipe pairs perfectly with the spices I add. The chili sauce is a blend of chilies, spices, garlic, and onions which are then amplified by my sweet and spicy chili recipe. Beyond buying a good cut of meat and BUSH’S® Chili Beans make sure your onion and poblano pepper is firm and not overripe. 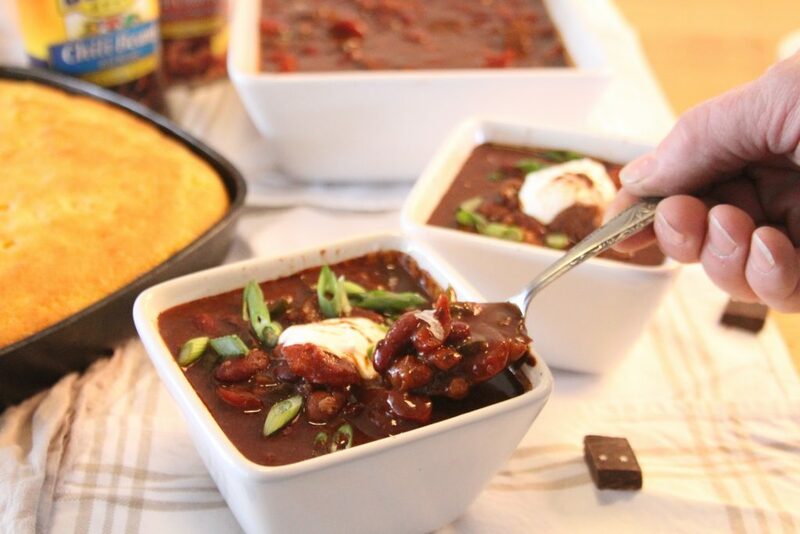 This recipe is great because the heat level of the chili is completely up to you. 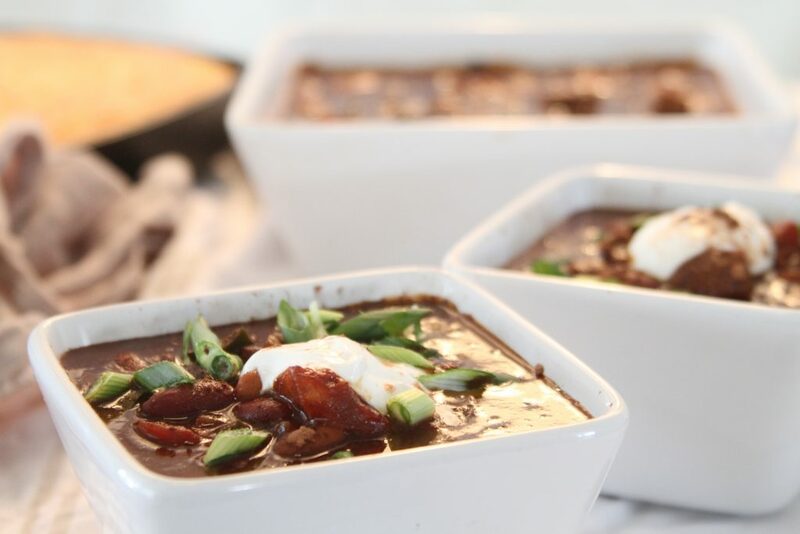 If you like your chili with some extra heat replace the poblano pepper with a couple jalapenos, with or without the seeds–remember the seeds add even more heat, or amp up the cayenne and cumin. BUSH’S® Chili Beans wants you to be happy with their product. 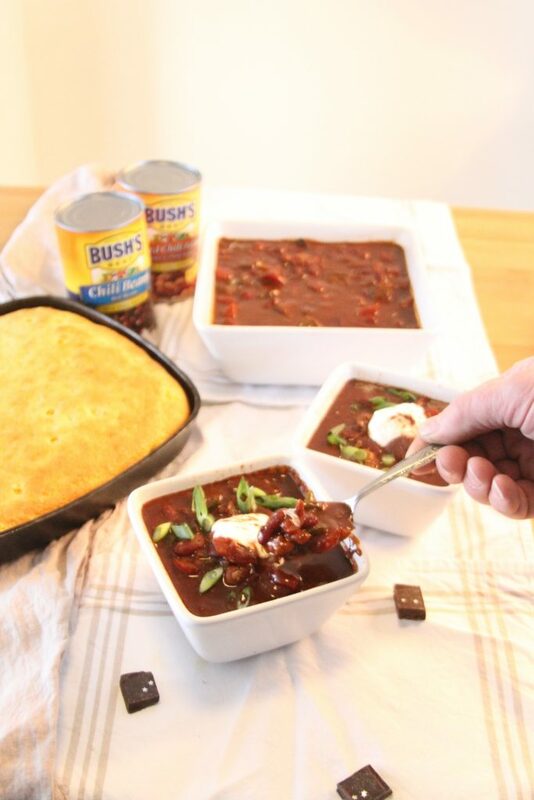 If you are not satisfied with the BUSH’S® Chili Beans product you purchased, you can register to receive a coupon for a free BUSH’S® Beans product up to 16 ounces. This could include BUSH’S® Baked Beans, Variety Beans, Savory Beans and more. Some restrictions may apply. Visit bushschilibeansguarantee.com for complete terms and conditions. TRAVEL SIDE NOTE: You can visit BUSH’S Visitor Center in Chestnut Hill, TN and follow the history of this family business all the way back to 1897! It has been on my bucket list a while. Hoping to check it off this year! NOTE: Combine chili powder to salt and pepper in a small bowl, and give it a good mix. In a multi-pot, set to saute, drizzle a bit of olive oil in the bottom of the pan, add the meat. Turn every couple minutes to brown evenly on each side. Turn off saute and set the multi-pot to 10 minutes on pressure cook. This is optional, I think it makes the meat a bit more tender but the choice is yours. Remove meat from cooker, set the multi-pot back to saute another drizzle of olive, when warm add the onion and poblano pepper, saute until tender. Turn off multi-pot. Add the remaining ingredients through shaved dark chocolate*. Give it a really good mix. Set the multi-pot to slow cook for 4 hours. 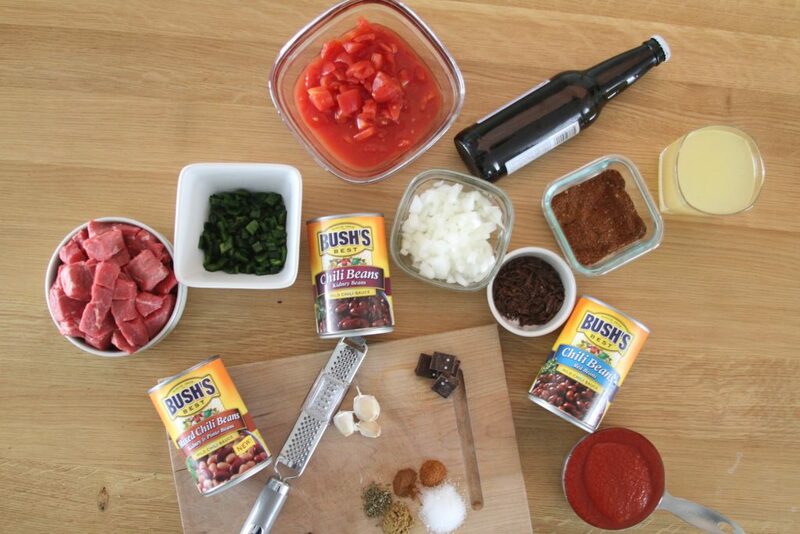 After the chili has been cooking for two hours open it up and add the two cans of BUSH’S® Chili Beans. Replace the lid and continue to cook for two hours. This keeps the beans from getting mushy. IMPORTANT: If you are using the multi-pot method go ahead and toss all ingredients in the pot. *Adjust the liquid (beer and chicken broth) according to the liquid to solids ratio you like. If you skip the beer, add more chicken broth. The recipe is flexible and forgiving just remember to add a bit of liquid at a time until it’s at a consistency you like. I guess you could use the multi-pot meat/stew setting for 25 minutes, BUT I feel like the longer it cooks the more time the flavors have to get to know one another and give the sweet and spicy chili a richer flavor. Either way is good though.